Established in 1979, Cambridgeshire based, Teloman, offer a range of products to the UK hospitality market. 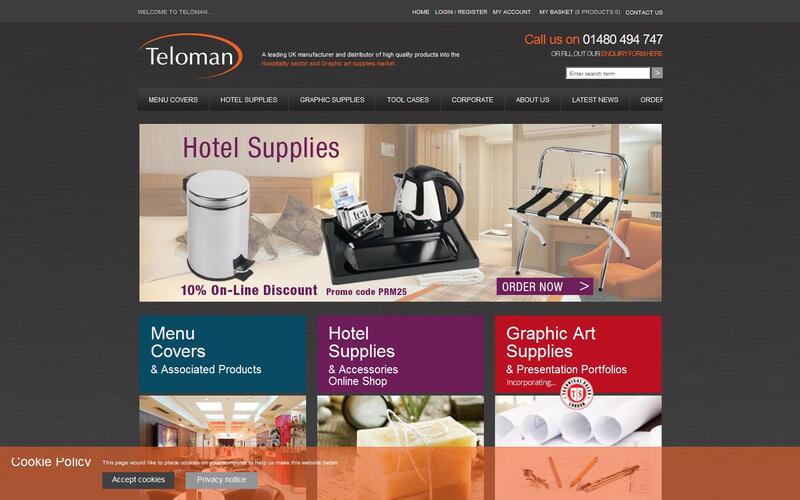 From presentation products, conference products, restaurant products and guestroom supplies, Teloman offer the UK’s largest ranges of hotel and restaurant equipment within the industry. As a leading UK manufacturer of high quality presentation & display products and accessories for the hospitality market, we are your number one choice for all your hospitality requirements. Desk Blotters, Pens, Pencils, Registration Book, Suggestion Box, External Cigarette Bin, Personalised Menus, Stock Menus, Bill Presenters, Restaurant Diary, Place Mats, Reserved Signs, Trays, Menu Case (External), Blotters, Conference Box, Guest Information Folders, Tissue Box Covers, Waste Paper Bins, DND Signs, Hospitality Tray, Kettles, Tea/Coffee Holder, Ice Bucket, Hair Dryers, Clothes Brush, Slippers, Luggage Racks, Coat Hangers, Blanket Bags, Laundry Bags, Ironing Centres, Toiletries, Pedal Bins, Toilet Brush Holder, Mirror, Hygiene Bag Holders, Bath/Shower Mats, Plastic Cups, Clothes Line and Rubber Ducks. For more details on any of our products or you would like to know about a specific product, please contact our experienced sales team or alternatively visit the Teloman website.